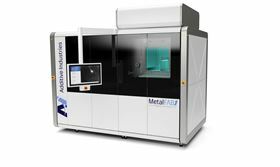 Additive Industries’ MetalFAB1 industrial 3D metal printing system. Additive Industries has developed an entry-level model of its MetalFAB1 industrial 3D metal printing system. The system has been designed specifically for process and application development, and prototyping. It has a compact footprint and lower price for first time users to gain experience with metal additive manufacturing before scaling up to series production. The machine features modular architecture, which makes it possible to upgrade to a full size MetalFAB1 system later. The technology and build volume (420 x 420 x 400 mm) are the same as the larger size systems for series production. This story uses material from Additive Industries, with editorial changes made by Materials Today. The views expressed in this article do not necessarily represent those of Elsevier.